As with many issues related to pregnancy and parenting, there are many myths and misconceptions about gestational diabetes. Gestational diabetes has been a controversial topic for some time, with even world famous obesterician, Michel Odent, weighing in on the matter. Some medical and health professionals believe gestational diabetes (not to be confused with type 1 diabetes) is a “diagnosis looking for a disease”, because the steps to manage it is exactly the same as the advice to prevent it – with diet. Women diagnosed with gestational diabetes are given a label, without any evidence to show that the label improves outcomes. Low carb eating (which includes an adequate intake of protein and healthy fats), quitting smoking, getting enough sleep, and doing some exercise is how you can best help prevent and treat insulin resistance. Recently, a study found that pregnant women who were having less than 6.25 hours of sleep per night were significantly more likely to be diagnosed with GD. How could that be? While we sleep, our bodies generate hormones involved in appetite control and metabolism. If we don’t get enough sleep, our body will secrete less leptin, a hormone that signals to us that we are satiated after eating. In addition, levels of ghrelin (known as the hunger hormone) will increase with less sleep, making us crave foods which provide a quick hit of energy. A diagnosis of gestational diabetes results in the very same advice which should already be given to all pregnant women, long before their glucose tolerance tests. They should eat a low GI diet, eliminate sugar and processed grains, eat enough protein and healthy fats (both help with feeling satiated and stable blood sugar levels) as well as get some daily exercise. Very wise advice for all of us, regardless if we’re pregnant or not. However, the vast majority of doctors and midwives are not trained nutritionists, dieticians or researchers – it’s not their job. This means quality dietary advice often slips between the cracks, or the wrong information is given. For example, it may be suggested to use low fat milk instead of full fat. However, low fat products usually have added sugar to compensate, so everyone ends up wondering why blood sugar levels don’t improve. Simarly to type 2 diabetes, gestational diabetes is primarily a lifestyle condition. Yes, there can be genetic inheritance, but just like some people are intolerant to gluten, those with diabetes are intolerant to sugars. So it’s important to control this with lifestyle factors, just like those with gluten sensitivity cut out gluten. As Doctor Chatterjee says, “Our genes load the gun, but it’s our environment that pulls the trigger”. In order to have the lowest risk of gestational diabetes, a woman should have a healthy lifestyle before conception. Recent research discovered women who ate a healthy diet, didn’t smoke, and exercised before they conceived, had a reduced risk of gestational diabetes by 83%. This is a highly significant finding — out of ten women, eight to nine cases of gestational diabetes could be preventable. You can still reduce your risk if you adopt a healthy lifestyle during pregnancy, but the reduction is not as high, at around 50%. But Isn’t Gestational Diabetes Due To Hormones Or The Placenta? The biggest myth people believe about gestational diabetes is that it occurs due to being unlucky with hormones or it was the placenta. But if this were true, wouldn’t all pregnant women get it? Or is it because some women have insulin resistance already? Insulin resistance takes time to tip over the edge and has no to little symptoms. Despite the pile of research showing significant percentages of women being diagnosed with gestational diabetes are due to dietary and lifestyle issues, this hormone belief is preventing women from knowing the truth. Lifestyle factors impact and mess with our hormones. Here are nine things that mess with your hormones – and what’s number one? Sugars. But Can’t Gestational Diabetes Have Genetic Or Hereditary Factors Too? Yes, it can. 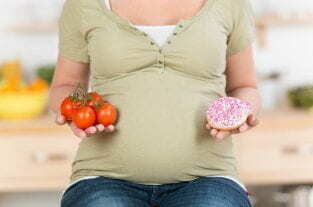 Factors that can increase the risks for gestational diabetes are PCOS (poly cystic ovarian syndrome, which also has significant dietary factors), being overweight, having fat in the abdominal area (apple shape), a sedentary lifestyle, consuming a high sugar and high processed food diet, genetic factors and hereditary factors. It’s well known that a child inherits genes from the mother and father, and the way those genes are expressed (turned on) or not, are due to modifications to DNA. Research has begun to uncover the extent at which diet impacts the health of our unborn children. Researchers have found the health of the parents at conception (and even before then) can affect what the child will be genetically predisposed to. A recent study found a mother’s diet before she conceives can affect her unborn child’s genetic make-up and immune system. A similar study has just come out about fathers too. It’s all the more reason to ensure you eat well if you’re already genetically predisposed to gestational or type 2 diabetes. It can help to break the cycle, rather than continuing to trigger the gene expression. In Which Ways Is Gestational Diabetes NOT Diet Driven? Is it possible to have gestational diabetes even though you have a healthy diet? According to Doctor Orr, those who use assisted reproduction have an increased risk of gestational diabetes. In study findings from the European Association for the Study of Diabetes (EASD) in 2015, they found women undergoing assisted reproductive technology were 30% more likely to be diagnosed with gestational diabetes. Researchers were unsure as to the link between assisted reproduction and gestational diabetes, but found those in the study who were diagnosed with gestational diabetes were more likely to be overweight, have a history of gestational diabetes, have a history of miscarriage and more likely to have a family history of diabetes. Therefore, diet (and the diet of our parents) remains a dominant, underlying factor. Diet is critical to treating PCOS, particularly cutting out sugar and grains. The root cause of our health problems must be investigated and addressed, or we have nothing more than a bandaid fix… and bandaids always fall off. Isn’t it frustrating when you have a friend who seems to get away with everything they eat? No matter what food or drink they consume, they don’t put on any weight. However, skinny doesn’t always mean healthy. You don’t have to be overweight to have gestational diabetes or other fertility problems, like PCOS. The erroneous saying “eating for two” doesn’t help the fact that many mothers-to-be think pregnancy is a free for all, as far as food and drink is concerned. Something many people don’t realise is a bowl of pasta will spike blood sugars more than a chocolate bar, many times. “But then, the resulting inflammation causes damage to organs and the body through oxidation. There is actually cell damage. Plus the body stores the fats, which we are now calling “obestrogens.” The resulting oestrogen dominance also causes more issues in the body — and more inflammation,” says Doctor Orr. So while the news may sound grim at first glance, there is a positive side to the story. It starts with a decision — yours — to help prevent the cycle of lifestyle conditions like gestational diabetes and type 2 diabetes… for starters. Doctor Orr warns pregnant women to be careful with their diets during pregnancy. Even if they decide to take the OGTT (oral glucose tolerance test) during pregnancy and receive a negative result – the test isn’t known for it’s high accuracy rate. If you also have PCOS, you are already at increased risk. A recent study in China found consuming more vegetables were associated with a decreased risk of gestational diabetes, and sugar was associated with an increased risk. At the end of the day, simple nutrition education before and during pregnancy is key. For more great information, follow Dr Andrew Orr on Facebook. This “article” is full of crap. I have GD and I eat a very healthy diet and I was exercising 5/6 days a week before I got pregnant. It’s not a lifestyle disease. If it were fitness instructors and women like me wouldn’t get it. Stop perpetuating stereotypes with unsupported opinions. A heap of peer reviewed research actually backs this, saying that a heathy diet and lifestyle (including no smoking) can reduce it by up to 80% if started before conception (and around 50% during pregnancy). Is that not a significant percent? There are also other possible issues, IVF is linked to GD and diabetes in the family of origin – we now know what we eat impacts future generations, so it’s indirectly diet related. Do you have some peer reviewed research to back your claim?? Also, so many people think they eat healthy, but they are confused (understandably with conflicting information and industry organisations who sponsor nutrition organisations). 80% or 50% is not 100% – so even if you do everything right, there is a risk of gestational diabetes. Lots of women (myself included) who work out regularly, eat well, and have never been overweight (or even close) develop GD. If it’s all diet and lifestyle, and it’s a “myth” that GD is related to hormones or the placenta, why does it go away for most women within a few days of birth? I think you are confusing risk factors with causation. Also, advising women to follow a no-carb diet during pregnancy is dangerous. Ketones in the urine during pregnancy are associated with lower IQs in children. I’m not suggesting a no-carb diet at all. There is also a big difference between nutritional ketosis and ketoacidosis which doctors often get confused about, however, I am not even suggesting keto in the article. To even be in mild/nutritional ketosis, you need less than 30g of carbs per day (approximate; depending on your own unique body, size etc). Where people get their carbs from is very different too. I am sorry but this article has really disappointed ! Perhaps you need to quote a dietitian who is trained in this area. Avoid pasta and bread? Aside from having his Masters in Reproductive Medicine and several other areas including women’s health, Doctor Andrew Orr is also a nutritionist. He knows what he’s talking about. The article says what not to eat. No advice on what to eat. Nutritionist, not a dietitian. Stop fear mongering and making mums feel guilty when they are already upset with the diagnosis with Gestational Diabetes. While you may have had their best interest at heart when you started, this article is not helpful to them. It would be more useful to title your article how to prevent Gestational Diabetes and forget all the crap about what they could have done wrong. Make this article more positive please. I think you need to use other researchers for your evidence. As a person who has gdm I am offended that you have all the so called evidence right there. How dare you make a statement making a pregnant mother feel worse then she already does for being diagnosed with gestational diabetes. You appear to be a person with nothing better to do the make judgements on others. Find something else to base your opinions on this is beyond your experience and you are not a dietitian or a doctor that deals with diabetes. Doctor Andrew Orr has spent 21 years treating thousands of women with diabetes (all forms). He’s not only a doctor but a nutritionist and has a bachelor of food science, amongst others. He has written in medical journals and lectures to medical professionals as well as those pregnant or trying to conceive. So the information is highly accurate and not sponsored by any food industry/organisation. Insulin resistance tends to be inherited, but can be prevented and controlled with a sugar and grain free diet, as well as exercise. There are loads of studies on this topic. So if you don’t have PCOS or used IVF, are you saying that the ONLY reason a woman would get gestational diabetes is because of not exercising and eating an unhealthy diet (before and during pregnancy)? Even if you are predisposed to insulin resistance (based on what you’ve inherited from your parents) if you don’t keep your insulin levels under control with diet and exercise, then it will be a problem. It’s not the placenta. Just like some people have gluten intolerance – diabetes is like having a sugar intolerance. And it’s controlled in the same way – avoiding the things that cause the problem. PCOS requires the same treatment, both conditions are impacted by the foods we eat. But you don’t have to have PCOS to have GD. Even active people can have one or both conditions. So is that a “yes”? As per the article, both Doctor Orr and I agree that poor diet and lack of exercise would be the most likely trigger for GD. Unfortunately we have seen diets prescribed for GD women (we surveyed women with GD), and some recommendations are actually making it worse. Even some of the women themselves were shocked at the processed diets being recommended to them. At the end of the day, it really does not matter how it was expressed – diet and lifestyle changes are needed to control and manage it now. It’s like asthma – lifestyle issues make it better or worse. If the diet is poorly controlled and there is lack of exercise, then it gets worse. If you get your diet under control and exercise, it gets better, so yes, diet plays and big role for sure. Yes unfortnately the diet given to most women isn’t good, they end up hungry and miserable. Doctor Orr and myself are currently writing a book to help women with GD, to take control in a way where they understand what’s going on, how they can feel full and also helps with insulin resistance. We surveyed lots of women with GD, and most said they felt really informed by their doctors about their condition, but not many people got the questions right. When we asked people at the end if they would be willing to pay for something that addresses all their concerns, reduces their risks and has dietary information which makes them feel full, happy and well, the majority said they would love to know all of the information, but didn’t want to pay anything. As you can imagine, it takes time and money to put decent information together (let alone advice from a very experienced doctor!). But we’ll continue with the book and see how we go. Your article is absolutely rediculous. I see a dietitian and an endocrinologist for gestational diabetes. I had recorded my diet prior to seeing these doctors and found my diet was not the cause of my gestational diabetes. I in fact lead a very healthy lifestyle. I check the food labels before food goes into my body. I avoid chemicals, high sugars, and I have absolutely no sweet tooth. I bicycled 6 miles daily until my 6th month of pregnancy, with my toddler in tow behind my bicycle. Yet your article has the nerve to say I did not try to prevent this disease? I brought it upon myself? Excuse you? Let’s begin by stating you shouldn’t be looking for the amount of sugars in an item. Carbohydrates break down into glucose. The total carbohydrates listed include sugars. You should be ashamed of yourself for trying to make someone feel this could have been prevented and this is the woman’s fault. Stop retorting with your research. Do more research, especially from more people who do not share your view. This article is completely one-sided. Did you purposely choose to not read the many articles stating gestational diabetes is not the fault of the mother? I am not saying there are not times poor diet and lifestyle choices are not the cause, but I am saying this is not always the case. Educate yourself further before writing nonsense in the future. Hey Angela, I see you’re upset with the information in this article. Rest assured, the information and research is backed by doctors, including the one who featured in this article – he’s also a nutritionist and has many, many years experience treating and teaching about diabetes. So he does have qualifications (multiple masters degrees amongst them) and loads more knowledge and experience than you or I would have on these topics. Can you tell me, what is a typical daily diet for you? There is a lot of misinformation. Here in Australia, the DAA (dietician’s association) has corporate sponsors and recomends their processed food products. I think it’s a huge conflict of interest and also dangerous. I have also seen menus given to women with diabetes (in hospital as well as out) and they shock me, as well as others who know why there is so much diabetes and so little being helped and off medications. I actually surveyed a heap of women with GD, and they felt they had been very well informed about their condition. But, many of them got important questions wrong about their condition. We take what we hear as gospel when being open minded and curious can help us to find solutions. If this article is based on research then you should reference the peer-reviewed articles you are basing it on. One doctor and your opinion does not make for a a well-balanced article, and this article is certainly not evidence based. Shoddy bordering on irresponsible. Two studies are hyperlinked in the article. All links are in orange and bold for contrast. Fiona, can I ask your qualifications? I can assure you, more than two doctors (as mentioned in the article), multiple studies and myself believe sugar and grains are increasing the rate of gestational diabetes. But if you have an explanation I would be open to hearing it. One of your studies linked to another of your articles, lol. I have just been diagnosed with GD and I have a healthy lifestyle, I am extremely active a gym bunny, 4-5 times per week even during my pregnancy, I dance, lift light weights and I also am a Fitness Instructor by trade with nutrition level 3 cert.. “Oh and before you, make reference to my qualifications, I am always topping up my knowledge on a daily basis in these areas”. My carb and sugar intake has always been very low as I have had IBS since I was a child and so I have made it a lifestyle to eat homemade no processed, low carbs, high fiber with lots of water. I rarely have treats, takeouts or a day that I am inactive. My GP and midwife are baffled that I have GD and only tested me as a matter of course as I had a total of 6 miscarriages prior to this successful pregnancy. I should also say at this stage I am almost 40 and up until this point have been tested in the past for type 2 and all results before conception have been negative. So tell me what do you make of to that? As I mentioned in response to another person, what we eat during pregnancy can impact three generations – there is increasing research on this topic. Also I would be curious if you know if you have PCOS or not? Fit and healthy women with PCOS can also get GD. I’m sorry to hear about your 6 miscarriages – sounds like there’s something underneath that hasn’t been picked up previously. A good women’s health and reproductive specialist would be able to do more investigations to find out what’s going on underneath. I’m not sure where you’re located but Dr Andrew Orr is awsome at digging out the root causes of problems, and he does Skype consults. It’s wonderful you’ve eaten so well, it will help reduce the severity of your issues, and help protect your child too. Firstly I think the article has valid points and was an interesting read. I had GD with my first pregnancy and treated it very seriously and changed my diet dramatically. My first born (girl) was full term and a tiny 2.6kg. 7 Years have past and I am pregnant with my 3rd (girl) and I have just been diagnosed again with GD (Funny I never got it with my second – boy). Prior to conceiving number 3, I was at my fittest and healthiest. Two years prior my husband and I had dramatically changed the way we ate to clean eating. We don’t eat processed foods, have eliminated refined sugar and increased protein and veg & fruits. My husband consequently lost 20kg! I was down to my healthy weight of 52kg and very happy with my body. I became cycling mad and rode 4 – 5 times a week averaging 40-50 ks each ride. I had literally just finished a 160 kilometre race before finding out I was pregnant. I felt amazing, I did everything right and was truly happy with my body and health. Due to the dizzy spins I stopped riding early on in this pregnancy but my diet has not changed. We stick to our healthy eating habits so I was truly shocked when I was told I was GD again and to be honest devastated. I don’t believe I physically contributed to this with poor diet and exercise. I want to know more based on genetics. I have two cousins that have type 1 and two uncles with type 2 diabetes. Am I just predisposed to this genetically? How much do genetics actually play a part here? What are your parent’s histories? Did they have any risk factors? It’s wonderful you are eating clean and exercising to decrease your risk of problems, it changes generations when we eat better. But if our own parents or grandparents had a poor diet (or simply high grain/high sugar) then it can impact what we’re prone to. Also, what sort of fruits and how much are you eating? I eat LCHF, more keto at the moment, and I have cut out fruit altogether. The lower carb fruits are strawberries and blackberries, but most fruits are out. Make sure you have enough healthy fats too. Oooh just remembered this post I shared last week. It has to be THE very best TED talk I have ever seen, presented by a medical doctor, who is now an integrative doctor (and famous on UK TV!). Almost 2,000 people shared this from my Facebook page (not the BellyBelly one). Highly recommend the 18 minute watch, or the transcript is there to read too. I didn’t get GD in my first pregnancy but have now found out that I have it in my current, second, pregnancy. I am 6 months pregnant and have gained only 6kg. I have continued light weights and light cardio throughout my pregnancy 4-5 times per week. My diet is not the issue, I know its healthy, 5+ serves of veggies every day, no processed foods, no low-fat food in our house, only the occasional treat, low to no sugar 90% of the time. There is no history of diabetes in my family., I dont have PCOS and I had a natural conception. Your article indicates that I am responsbile for my diagnosis – please can you advise what I should have done differently to avoid it? Or what I should do / change now to manage it? Anna, we’re definitely not saying you’re at fault. Either way – we can all only make decisions and choices based on what we know at the time, and this area is so confusing with so much conflicting advice. While diet is a significant cause (as verified by research), there are people who break the typical expected pattern. I like how Doctor Orr explains, just like those who have gluten intolerance, diabetics have a sugar intolerance. So if you’re eating no grains and no sugar, and if you lead a healthy life (no smoking, exercise) then you’re doing the very best you can and reducing your (and your baby’s) chances of type 2 diabetes in future, which is awesome. I ran a sub 4 hr marathon 1.5 months before I got pregnant and was training for a 50 mile race the month before and the 1st month of pregnancy. I was running 50-60 miles a week plus doing strength training 3 times a week. I was on the Whole30 diet the month before I got pregnant and the 1st 45 day of my pregnancy. When I went off the diet I went on a Paleo diet. I have kept exercising and have ran up to half marathon distances at 4 months. I am now 6.5 months along and just got diagnosed with gestational diabetes. If exercising and eating right prevents GD how did I get it? I ran 3 full marathons last year and was on Whole30 5 full months last year so it wasn’t that I was healthy before. Thanks for your question. Sounds like you have a very active lifestyle and are eating great food, so it can be confusing to get such a diagnosis as this. As Doctor Orr explains, if your family has diabetes, PCOS (which can be diagnosed or undiagnosed) or insulin resistance issues in their background, it can predispose you to it too. Then the slightest change can set off the trigger. Science has shown us that what we eat during pregnancy impacts three generations. So by eating well now, you’re doing a wonderful thing for yourself and your children… and their children. Or you may have a false positive. I’ve supported a woman who was living a very healthy lifestyle and was borderline GD. She was able to have a normal birth (in fact she was pushing when I arrived into hospital, not long after she got there!) and she was able to stay in the birth centre, and not be transferred to the normal birth suite. She had a positive experience, which I believe is attributed to her healthy lifestyle. It may have been different otherwise. “No test is 100% accurate, but testing has got so much better than it used to be and it picks up more women than it misses. The things is, many women do not realise they have conditions and family genetics that put them at risk of GD. And many women I know say they have a great diet, while shoving in refined foods… after saying they don’t eat much of it. Many women have PCOS and don’t realise it, which is caused by insulin resistance (IR), either dietary, or hereditary. The hereditary insulin resistance often doesn’t show up into pregnancy when they get GD. They can be thin and look healthy etc, but this is where the misinformation happens. Sure, overweight people are more likely to have IR, but thin people who look healthy can have it too, from genetic links. Even the ones who are healthy and do paleo can still be at risk of GD, purely through hereditary links. It is just that the diet they eat actually helps suppress that expression. Hello I just found out today they diagnosed me with gestational diabetes once again. I think it wasn’t caught in my first pregnancy because my son was 9 pounds and I got very sick. My second son they caught very late and it wasnt until I had a gran mal seizure in the hospital while waiting for my ultrasound that they had realized I had gestational diabetes. I am almost 5 mos pregnant now. I have lost over 30 pounds while being pregnant. I haven’t been able to eat much and I have always had issues nce son s born with low blood sugar. I am beside myself because I 42 years old high risk as it is with all of the medical issues I have. I find this so interesting. I know there is a lot of anger and feelings of injustice surrounding gestational diabetes, and this article does a great job of making people feel like it’s their fault. I too feel as though many of the factors listed in this article do not apply to me. I make almost all food from scratch, have no bread/cereals in the house, understand the difference between simple and complex carbohydrates and how they break down in one’s body, eat full fat dairy (when I eat dairy) and track my macronutrients using MyFitnessPal. I walk an average of 5-10 miles per day (I used to be a runner, but knee problems have made running quite difficult) along with hiking, biking, skiing, cross country skiing, etc. My resting heart rate averages 54bpm, and my blood pressure is consistently quite low (and even lower in pregnancy). After becoming pregnant, I gained 2lbs through the first and second trimester, ate a mainly vegetarian diet which consisted of homemade soups (yes, I even made the stock from scratch), beans, and salads. I had absolutely no sweet tooth. I exercised throughout all of my pregnancy. 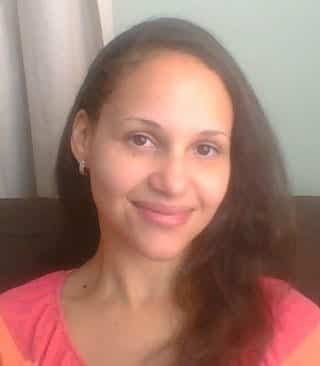 At 28 weeks I was diagnosed with GDM, and met with a diabetes nutritionist. Now this is where we agree- they gave me a diet plan that was a load of bunk. The foods that I was supposed to eat were not nutritious: low-fat dairy, rice, breads and pastas were all suggested. I knew better and stuck to my normal diet, despite being berated and told I needed to eat more carbohydrates and that carbohydrates gleaned from complex sources, such as leafy greens and low starch vegetables “didn’t count”. I understand the difference between nutritional Keto sis and ketoacidoses, so I had no fear that the amount of carbs I was eating was causing the baby harm. I have stuck to my guns and am completely diet controlled with excellent blood glucose numbers. Not only that, I just had my 32 week ultrasound and my son is measuring in the 20th percentile, so not large at all. I have no risk factors except for being over the age of 25. Oh- and I got pregnant on my first attempt. No fertility treatment and no PCOS. Maybe I’m the exception to the Rule. However I have a hard time believing that 90% of the women diagnosed with this could have changed their likelihood of getting it by diet and exercise. I also have a hard time understanding how all the women out there who eat highly processed, high carbohydrates diets and who are completely sedentary are not developing this, given the information shared above. I know there are more than 6 to 8% of the population who fit the bill. I just find this article frustrating. Thanks for this!! I am in exactly the same boat. Healthy, fit, cook from scratch, no history, no PCOS and no IVF. I have been ratting my brains trying to think about what I did wrong – did u not have enough water? Was I too stressed? Did I eat TOO healthy?! These comments help me realize it’s nothing I did, it’s my hormones playing up and everything will be ok.
Chiming in here late. I grew up with a pre-diabetic mom (who also has MS). Diabetes and auto immune disease runs in our family. She instilled in me the understanding of simple carbs vs. complex carbs, protein, healthy fats, organic eating, etc. She’s stayed off meds through controlling her diet – which I adopted years ago (especially after my own diagnosis of ulcerative colitis – very similar diets). I ate that way years before getting pregnant and worked out 5-6 times a week at a high level of intensity. I continued to eat that way and maintained my workouts during pregnancy. Yet here I am, 27 weeks pregnant and 35 years old, getting ready to fail my second glucose test and get slapped with a bad lifestyle label. A very, very difficult pill to swallow (although probably not a huge lifestyle change for me since I already do the right things). While lifestyle can play a role, it doesn’t always. A more balanced article would be helpful to also explore the impact of genetics, age, etc.